Prime Minister John Key says it would not worry him if Act deputy leader Heather Roy became co-leader of the party with incumbent Rodney Hide. Responding to questions at his post-Cabinet press conference yesterday, he said he would not feel any need to renegotiate the confidence and supply agreement with Act. "The leadership of the Act Party is a matter for Act and not for National," he said. 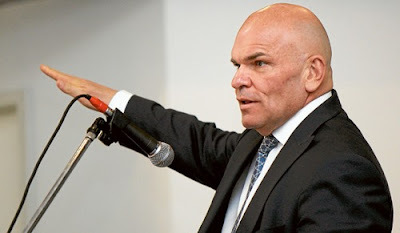 This was on TV3's hour of Government cuddles, 'The Nation n Friends' so no one really noticed it, but Key's greenlight of a co-leader position is an acknowledgment that the radical wing within ACT hate Rodney and that like it or not Key has to do business with that radical fringe. Key's anointing of Heather Roy as co-leader is a big back down to Key's last desperate defence of Hide to stop the radical fringe from rolling Rodney. ACT are fucked. They used to have this pretension of 10% support when they were a genuine liberal party, but now they are a one electorate seat, fringe sub 5% threshold Political Party that dabbles with the Sensible Sentencing Lynch Mob and Climate Change Denial, right now ACT have as much chance of being seen as a 10% wide based political party as the flat earth society does. Let the rats turn on one another, Key will keep the door open for Rodney to jump to National if ACT disintegrate by offering him the National seat of Epsom if the worst comes to the worst.